Pizza. Invented ages ago because flour, tomatoes, herbs & cheese were easily accessible and cheap to make, Pizza has become that one food that is pretty universal. I have had my fair share of pizza in my thirty years on earth, something I am quite proud of-haha and every time I find a place I really like, I treasure it. &Pizza is one of those places. I had been invited out for their new location in Harvard Square along with Milk Bar in the same location. First of all that vibe? Dope. The people? Also equally dope, but the Pizza is where its at. Now lets not talk about traditional pizza, because traditional this is not. Their pizzas are an oblong, flat style with just the right amount of crunch and not over saturated with ingredients. They have several staples to choose from but my favorite part is that you can build your own and the fact that there is NO judgement with whatever you create. I have come up withe coolest concoctions like Shrimp & Garlic Ricotta Pizza with a Fig Balsamic Drizzle ( WHAT) and a Chicken Pesto with Spicy Tomato Sauce. The idea of being able to create and not being charged an arm and a leg for toppings is also another one of the things I love about them. &Pizza’s 34th shop in Harvard Square has become an all time favorite and while it has been a phenom since 2012 well before I ever knew about it, in my mind they continue being amazing not only because of their food but because of the company itself and what it portrays. Want to know my biggest regret though? I walked by Michael Lastoria and didn’t talk to him or ask him for a selfie ( I know fail) As the founder of &Pizza that would have been equally as dope as the pizza itself—> In my defense I didn’t know who he was at the time. 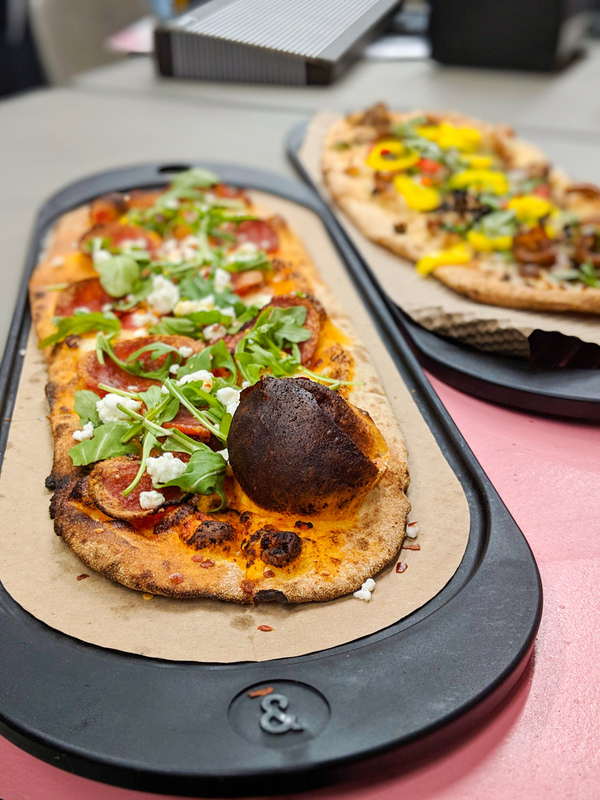 Plus who can go wrong with a chill pizza place that also happens to have a Milk Bar location inside of it ( GASP) I have had a love affair with Christina Tosi’s concoctions since I saw her on Chef’s Table…but I digress, this is about pizza. Go check them out and check out all the cool photos I have taken from the many times I have happened to go. American Honey, a soda mix I created + this menu! Pizza & Soda- what can ever go wrong with this combo? Have you guys checked this place out? What are some of you favorite pizza places to check out? Tell me all about them below in the comments!! I have been wanting to check this place out, and the milkbar too! I used to live in that neighborhood years ago and haven’t been back to visit in over 2 years. Maybe this summer I’ll make a visit.